music and guitars in Linux. And whatever else comes to mind. In 2010 Fender came out with the Mustang range of amplifiers. These are incredibly cheap modelling amplifiers starting at 20Watts (or the 7W battery model), going up to a 150Watt head and this year introducing a floor-unit based on the same technology. I ended up getting one of these a little while ago while looking for something that was more of an all-rounder than my last practice amp. As always, Linux Journal has already managed to do a great article on the Mustang, but I thought it would be worth sharing my experiences (the amp itself, Fedora and Windows) and a couple of tricks they missed. Of course if you know what Fuse an Plug are already and just want to get to the technical stuff then jump ahead. Since the Mustang has been around for nearly 2 years lots of other people have written about it. Mine is the small one, a Mustang I for home practice. From model III upwards there are more controls on the panel and a lot more kick. In the shop it came down to this or a Vox Vt40+, if you're wondering why I was comparing the Fender with a Vox twice as powerful, it's because they didn't have the smaller Vt20+. If they had done I might not be writing this article. Both sounded fine, maybe it was a bit easier to get the Vox into drive, but for both it was also clear that it would take more time to get the best out of them, and it's the approach to controls that really sets them apart. Ignoring tone and volume knobs, the Mustang's amp and effects section is less easily configured than the Vox's. 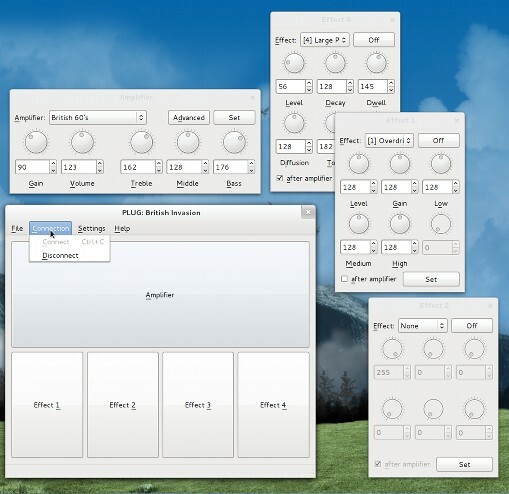 There is one dial controlling presets (tied to amplifier models), one dial selecting modulation effects and one dial selecting delay and reverb. Getting a sound amounts to spinning through the presets and finding one you like. The Vox on the other hand controls everything separately and it's a lot more obvious how you might do things like adjust effect levels. I came away with the Mustang only because the Vox couldn't be reduced to a volume I thought was usable at home, but the Mustang definitely had some good sounds in it. The Mustang is fun though; all you need to do with it is turn it on, find the amp model you want by spinning through the presets and then get playing. Actually, a lot of things can be tweaked on the panel once you've read the manual, but not all (at least for the I & II models). One of the most noticeable things about this amp is the USB connectivity (because it's in big letters on the box). There's no official linux software, but, thanks to one Linux developer and the use of USB Audio, everything you can do in Windows you can do in Linux. What can you do? The USB interface provides both more detailed control of the amp settings and a direct digital recording interface. With the settings control you can adjust all the settings for the individual effects, meaning you have as much control over the Mustang I as the Mustang V (there are still differences in the hardware), and you can do things to the effect order and application that are impossible through the panel. There is a dual purpose headphone/line out jack, so you could just use that (see the Jack setup and let the right noise in posts), but using the digital connection avoids any interference and the possibility of ground loops arising between the computer and the amp, plus you can hear exactly what you're playing while recording, sounds like a good idea. To get this working in Fedora just plug it in. The Mustang will appear as a recording source in the sound settings, note that the amplifier wont act as a speaker - you can't play back through it. One thing I've noticed about this though, in newer firmware there is a 'USB gain' setting. This is recorded in the presets and set to the lowest possible in most. If you find that the recording level is too low you can adjust it by holding down the 'exit' button on the amp while turning the 'volume' button. This wont change the normal volume setting, though the amp does take the common 'last remembered position' approach, so if you adjust the actual volume afterwards then that jumps to whatever the dial was left at. 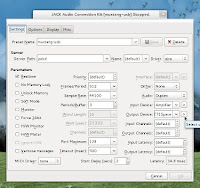 Start qjacktl (from the sound and video menu) hit the stop button if Jack has started. Execute script after startup has "pactl load-module module-jack-source;pactl load-module module-jack-sink"
Execute script on startup has "pulseaudio -k"
Go back to Settings, if you want to keep your current setup then name and save it. Name and save this as a new preset, click okay. That's it, you can try out pass-through by opening the connections window and connecting system in to system out, this will now send the Mustang signal direct to your soundcard. Of course if you're monitoring through headphones or computer speakers then you might not want the amp speaker going, just turn the master volume all the way down, this doesn't affect the recorded sound and isn't stored in any of the amplifier presets. You can use the names (in square brackets) as hw:Name, (e.g. hw:Amplifier) in the input and output names in Jack. ...that's it. You don't need to do any messing about with groups, you might need to reconnect the amplifier. You can have one of each of four effect types (modulation, stompbox, delay and reverb) and put them in any order. Each effect can be before or after the amplifier model. When you start Plug, provided the amplifier is connected, it will open and load the settings from the amp. You can tweak these, send them back to the amp, save them to a file or to one of the presets on the amp and you can also load presets from the amp. One Fedora tip: some windows wont have a 'close' button, you can right click the title bar and click close. Look out for Plug to be included in Fedora soon. Install the Fender ASIO driver and Ableton light (Ableton is a very nice real-time sequencer which you get free with the Mustang). Spend two days reinstalling drivers and trying different soundcards and settings to be able to record without a horrible screeching noise. Finally try plugging into a USB hub. It now works. Why? Who knows? Try to run the FUSE and Silverlight installer. Discover your .Net installation is broken. Try uninstalling .Net completely, reinstall. Try again. Find .Net remover from Microsoft support, try this. Eventually discover a reference to a subdirectory in your Windows install that has to be removed to allow class files to be rebuilt. I really like both Ableton and FUSE, but that was a painful experience. I hope most people aren't so unlucky with their set-ups. Thanks to Piorekf for creating the Plug software and corrections to this article, Kay Sievers for help with udev rules and many ALSA programmers who make sure that USB sound devices Just Work. This work by Ian Malone is licensed under a Creative Commons Attribution-NonCommercial-NoDerivs 3.0 Unported License.